Have you taken a break from running: Yes, especially after a race I will take some down time to recover and rest. In the off season I still run but my focus shifts from training to having fun = more trails!!! Coach or training group: I have trained with MCRRC in the Speed Development program, XMP- Experienced Marathon Program (Mike Broderick and Harold Rosen) and under advice of Chris Sloane. The hardest race you’ve ever run: Stone Mill 50 miler, all was great until mile 48 then it seemed like my knees kept buckling, I really had to focus and dig deep to push through the last 2 miles. 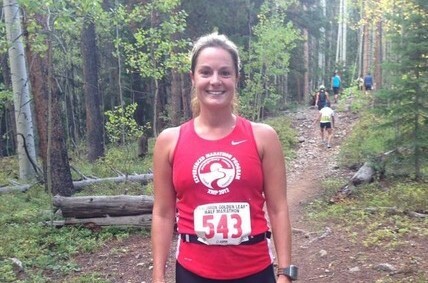 Most adventurous decision you’ve made with your running: To run a 50 mile trail race. Running mentors: Mike Broderick, Melissa Grady, Chris Sloane. My favorite place to run in the D.C. area is: Rock Creek Park. I love the Western Ridge Trail. I also love the C&O canal, especially in winter. I also love running through Georgetown down MacArthur and up Foxhall. Favorite local trail: Western Ridge and Beach Drive on the weekend. Ideal post-run meal: Dark beer and a soft salted pretzel. Pet peeve: When people wear their swag (shirt, jacket, etc) during the race that they got the day before the race. Goals: To run a sub 3:20 marathon and to go back to Boston for lucky number five! Your advice for a new runner: Don’t get discouraged, sometimes runs will be hard and you will feel deflated but you have to keep on trying and putting in the miles to make progress. Most important don’t be scared of the hills. Hills can be your best friend, try to run every hill you see! Explore new routes, so that you never get bored and find a group or some friends to run with to help keep you accountable to your training. Song in your head during a run:I don’t usually have a song in my head instead I count things along the way and am reflective. Have you dealt with a major injury: Luckily no, only the occasional IT band syndrome and once or twice plantar fasciitis. Running quote: Let the pain leave the brain, let the soul take control. You can do this! Why is the D.C. area a great place to be a runner: There is such a variety of routes and terrains that you can run, from being in the city to trails in the park to running along the canal. The variety of runs keep things fresh!